When Subaru revealed the all-new 2014 Subaru Forester in Japan on November 13th, Fuji Heavy Industries President & CEO, Yasuyuki Yoshinaga, introduced the new crossover with a unique new Projection Mapping presentation for those who were in attendance. The new 2014 Forester is about to make its North American debut at the 2012 Los Angeles Auto show, and Subaru has plans to show the vehicle's package in a unique new display that will be on the floor of the LA Convention Center. The Japanese automaker will display the all-new global SUV in their technical exhibit that will include the all-new Forester cutbody to reveal the vehicle's all-new package. The LA Auto Show display will also include an all-new Forester technology touchscreen to demonstrate the vehicle's technological advantages including Subaru's symmetrical AWD structure and functions. Attendees at the show will be able to see how Subaru engineers designed the new Forester that has been completely redesigned from the ground up. The new crossover has a broader profile, a roomier interior and a new 2.0-liter turbocharged boxer engine for the U.S. market. The fourth-generation Forester will feature the new turbo engine that will replace the outgoing 2.5-liter horizontally opposed turbocharged four-cylinder engine in the Forester 2.5XT model. The 2014 model will also come with a standard 2.5-liter naturally aspirated boxer four-cylinder powerplant that was introduced last year. Neither engine has been EPA rated yet, but Subaru says both engines will be more fuel-efficient than the engines they effectively replace. The new-generation Forester will also benefit from a new Lineartronic continuously variable transmission (CVT) that will also help increase fuel mileage. Subaru is not only counting on the new fourth-generation Forester to have an impact here in the U.S. market, but expects big things around the globe. Subaru is advancing its sales of the new SUV globally and it was developed to meet the demands of a changing world. In Europe and other global markets, the new crossover will feature an even more fuel-efficient diesel engine to power the 2014 Forester. While other automakers like Audi, who is introducing four new diesel models in the U.S., Subaru is not ready to make the expensive commitment to get their diesel boxer engine certified here in the U.S.
Subaru developed the all-new Forester with the goal to “maximize its value as a true global SUV.” The new crossover will feature Subaru's renowned and respected symmetrical All-Wheel Drive (AWD) system as its core technology. 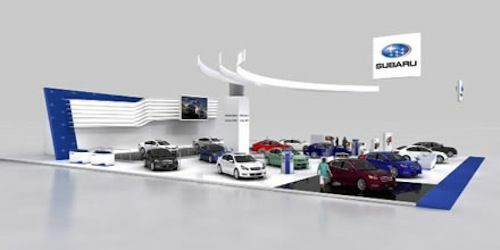 The new display at the LA Auto Show will reveal how the system technically works. The technical exhibit will also reveal how the new Forester has been designed with a higher level of drivability as well as enhanced safety and environmental performance. Look for the all-new 2014 Subaru Forester display at the 2012 Los Angeles Auto Show that will reveal its improved capabilities as an SUV with more versatility and driving performance.